After reading the articles and watching both the docudrama Codebreaker (2012) and the historical-fiction film The Imitation Game (2015), write an essay that talks about how the popular Hollywood film gets things “wrong”. How is what it is doing NOT a case of simulacrum, but actually a case of error–of twisting the history too far? How does it go against some of the best practices we’ve studied in class so far? In discussing this, focus not only on simple factual mistakes, but also on mistakes of tone and emphasis. Questions to think about: What does The Imitation Game make of Turing’s identity as a scholar and as a gay man, and how is this different from Codebreaker? How does the credit given to Turing for computing advances differ between each of the films and the article? Your essay should be between 900 and 1500 words, and should reference your sources using in-line citations, such as (_Codebreaker_, dir. Clare Beavan, 2012) or, (Hicks, “War Machines,” p. 14), etc. Since you may not be able to format in italics use an underscore at the beginning and end of titles of books or movies that should be italicized. Please leave an extra line of white space (hit “enter” twice) after each paragraph so your text doesn’t run together–the comment system doesn’t respect paragraph indents. Post your essay as a comment on this post no later than 10pm on Feb 26th (note extended due date). The usage of simulacrum is the slight modification of details, of a person or of a story, in order to strengthen the thesis of the movie. The Imitation Game might seem like a traditional case of simulacrum, but once the audience has more background knowledge of both the history of coding and of Alan Turing especially, it is evident that the modifications made within the movie are not the least bit slight. The creation of historical movies, such as this one, depend on careful analysis of information, specifically which parts of history to incorporate but more importantly which parts can be omitted. There are three major areas where The Imitation Game twists history too far; the theme that Turing was the sole genius behind cracking the enigma code, the false representation of Turing’s personality, and the intensified emphasis on his secrecy of his love life. Alan Turing was a British mathematician who became involved in Bletchley Park’s efforts to crack the German’s Enigma code, which was used to disguise morse code messages passed between the German army. According to War Machines, the process of cracking the Enigma code was an incredibly complicated endeavor made up of many different specialized people and machines. This fact was not expressed in The Imitation Game, where the creators developed Alan Turing’s character into the sole genius behind cracking the code. (_The Imitation Game_, dir. Morten Tyldum, 2014) This was done through creating scenes showing Alan Turing as a detached genius who preferred to work alone and created ideas by himself. (_The Imitation Game_, dir. Morten Tyldum, 2014) In reality, “by April 1945 there were a total of 325 workers, including 273 WRNS workers (all women), twenty-eight maintenance and construction engineers (mostly or all men), and twenty-four cryptographers and administrators (mostly men)”. (Hicks, “War Machines,” pg 23) Although Turing can be credited for having a substantial impact on the work at Bletchley, he was not the sole mind at work within the park. Specialized workers allowed for division of labor which allowed different workers to focus on a specific task, which propelled the whole body of workers towards cracking the Enigma code. Breaking the Enigma code was not a task of one man but a task of a whole team. Most importantly Alan Turing worked closely with a colleague, a fellow mathematician named Gordon Welcham, in order create the Bombe, which was one of the machines that aided workers in analyzing the German radio traffic. (Hicks, “War Machines,” pg 23) This collaboration between the two mathematicians was left out of the movie, creating the illusion that Turing was the sole mind behind the project. Even a similar media, such as the documentary Codebreaker, which had interspersed fictional dramatics, mentioned that Alan Turing worked with a colleague to create the Bombe. (_Codebreaker_, dir. Clare Beavan, 2012) Although these are just simple facts, they were kept out of The Imitation Game thus changing how the viewer would interpret the history. Within The Imitation Game, Alan Turing was portrayed as a socially awkward, misunderstood, and isolated genius. Although Turing was a genius and seemingly laid the seed for the computers and the future of technology (_Codebreaker_, dir. Clare Beavan, 2012), his personality was misrepresented. In one of the first scenes, Alan Turing was labeled as socially awkward when Commander Denniston mentions, within an interview, that Turing cannot understand a joke that others would easily pick up on. (_The Imitation Game_, dir. Morten Tyldum, 2014) This scene shaped how Turing would be represented throughout the movie. Although Codebreaker varied from The Imitation Game, due to its documentary style, the two movies had some similarities, the biggest one being the fictionalized scenes. In Codebreaker, the fictionalized scenes allow for the man behind the documentarial facts to be seen. These scenes were of private sessions between Alan Turing and his doctor Franz Greenbaum. (_Codebreaker_, dir. Clare Beavan, 2012) Through these sessions Alan Turing is not portrayed as socially awkward and isolated, but instead an analytical thinker with no social issues present. (_Codebreaker_, dir. Clare Beavan, 2012) On a more factual level, through an interview of Greenbaum’s daughters who Turing had increased contact with as he spent time with the doctor, they recounted that he always took an interest in them and would easily conversate with them. (_Codebreaker_, dir. Clare Beavan, 2012) This juxtaposition shows that the creators of The Imitation Game portray Alan Turing as a stereotypical genius type who is socially awkward and is only focused on himself rather than a more true to life Turing. A major part of understanding Alan Turing is understanding his private love life. Alan Turing was a gay man, during a time when it was deemed as illegal. Although it was a major aspect of his life, the secrecy of his love life does not deserve the intensified emphasis it was given in The Imitation Game. The Alan Turing of The Imitation Game was private to the point of secrecy about his love life. His co-workers never heard anything about it, but as John Cairncross later mentioned always had his suspicions of his homosexuality. (_The Imitation Game_, dir. Morten Tyldum, 2014) According to Codebreaker, Alan Turing was always open with his friends about his sexual preference, especially at Bletchley where we felt he was in paradise because he could be himself. (_Codebreaker_, dir. Clare Beavan, 2012) The Bletchley of The Imitation Game was a place where Turing’s own coworkers would threaten to turn him in for being gay. (_The Imitation Game_, dir. Morten Tyldum, 2014) This false representation truly takes away from the fact that during the war Bletchley was a place of change, not only for allowing women to work but for allowing a gay man to be himself as well. In both movies, a major theme is Turing’s love for his childhood friend Christopher. Although Christopher passed away at a very young age, he was still played a pivotal role throughout Turing’s life. Alan and Christopher shared a love of knowledge especially in mathematics, and this bond would propel Turing to his computational discoveries. This was portrayed in both films, but was taken too far in The Imitation Game. It was fictionalized that Turing named his precious machine after his beloved friend Christopher. (_The Imitation Game_, dir. Morten Tyldum, 2014) Although this fact can be easily changed, by naming it its true name the Bombe, it intensifies Turing’s love for his friend into a type of obsession. In reality, Turing had healthy ways of coping with the loss of his friend such as writing to Christopher’s mother, not just after Christopher’s death but over the rest of Turing’s life as well. (_Codebreaker_, dir. Clare Beavan, 2012) As the emphasis on Turing’s love life was intensified, the portrayal of it moved farther away from the truth. The movie The Imitation Game is an entertaining Hollywood portrayal of a historic event and person. Although it uses the common practice of simulacrum, the facts used are spun far from the truth. This allows for the fictionalization of historical events to be spread into the memory of popular culture for the sake of having a stronger emotional impact. It is necessary to keep these movies in check by inspiring the viewer to look deeper into the history these stories are based upon. The late philosopher Soren Kierkegaard described very clearly the shortcomings created by The Imitation Game, when he said “There are two ways to be fooled. One is to believe what isn’t true. The other is to refuse to accept what is true.” The plot is exaggerated and misleading, romances and conflicts are imagined, and Turing is portrayed improperly. In fact, Turing’s most important creation, On Computable Numbers, is not even mentioned. In its pursuit of box-office revenues and awards, The Imitation Game deceived millions and misrepresented thousands of others. To begin, let’s dive into the most apparent problem, the portrayal of Turing by Cumberbatch relative to the characteristics of the real man. As the film begins, we are told immediately, ”You think that because you’re sitting where you are , and I am sitting where I am, that you are in control of what is about to happen. You’re mistaken. I am in control, because I know things that you do not know.” (The Imitation Game, dir. Morten Tyldum, 2015) While this may be true, this is not typical behavior of the man described by Dr. Franz Greenbaum and his family. (Codebreakers, dir. Clare Beavan, 2012) In fact, throughout the film, the character seems to alienate those around him, unlike the charming presence described by those that knew Turing. The film goes so far as to script a conversation between Turing and Commander Denniston, implying that Turing alone solved enigma. This overstated significance is used to bring light to the travesty that befell Turing as a result of his homosexuality. He was forced to ingest hormones as a means of controlling his “homosexual tendencies.” In the film, they fail to mention the amount of work that he continues to do after starting the treatment. They display the change as so night and day, that he is seemingly depressed immediately after beginning. As corrected by the documentary Codebreakers, he did not seem to feel the effects that significantly until months into the treatment. The film’s only redemption is through his Turing’s friend and coworker, Joan Clarke. Yet the majority of their interactions are for the viewer’s entertainment. A love story that probably didn’t exist, and social anxiety that is unwarranted. The movie attempts to capture the stigmas felt by those that don’t have the ability to be open about their sexual orientation, and emulate it in the persona of someone who was open about his. Clarke, although portrayed accurately, was involved in conflicts that were made up. All these injustices are trivial in comparison to the factual differences in the film. The most intrusive and implicative aspect of this movie, was the “machine” he was building, and referring to it as Christopher. Although Turing did draw inspiration from his childhood friend, it is off-putting to fetishize it as such. And to what end? The machine he worked so hard to build in the movie, the bombe, was already in existence before he arrived to begin work. In fact, his greatest contribution to the military was his algorithm on a different machine, for detecting expected phrases called cribs (Hicks, “War Machines,” p. 10) within the messages themselves before running the machines, reducing the number of possible options, and therefore runtime, significantly. And the most useful machine overall, the Colossus, was not even mentioned. The list keeps going. And is it progresses, it only gets worse. Until now, I have only mentioned single people are small groups of people being victimized. This movie, in only one scene, comes close to mentioning the significance of the individual human computers. Thousands of people were involved in creating the information processing network of Britain at that time. To attribute the endeavors of thousands of dedicated people to one man is egregious. It may even be fair to label it irresponsible. Leaving this information out of the most viewed “account” of this event will inevitably prevent viewers from appreciating the truth. A whole part of history is looked over, first by the producers of this film, and unfortunately in turn, by millions of others. The legacy of the Woman’s Royal Naval Service, and integral component of the success against the axis powers, was entirely left out of the film. Showing one scene where a few women pass around messages at computing stations does not do justice to the technical knowledge and prowess of the represented constituents of this poorly designed and displayed simulacrum. The sad part is that this is only a slight injustice relative to their treatment at the end of the war. All of these technically literate women had few chances to continue pursuing this career. As the men who served overseas returned, they took the positions back from the better skilled women. (Hicks, “War Machines,” p. 22). And if we continue to allow misinformation, these situations are bound to repeat themselves. 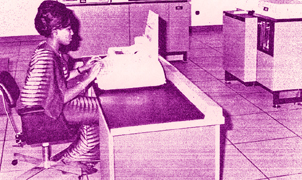 Although the gender landscape in computing positions wasn’t entirely lopsided, it was severely masculine. Luckily, a few groups, and the Civil Service held on to some of the talented prospects. I personally did not know the extent to which women were responsible for the emergence of the computing era. In that ignorance, I made false assumptions that stuck with me for years. I was lucky enough to learn the truth, and I recommend that anyone who watches The Imitation Game does also. “Nothing in all the world is more dangerous than sincere ignorance and conscientious stupidity.” Where we have the ability to improve upon past mistakes, being content with misinformation is the biggest obstacle, and Tyldum did no one any favors with this film.